In the third of Channel 4 News Labour leadership interviews, Diane Abbott tells Krishnan Guru-Murthy she was right on many policies during the New Labour years, adding "I'm the genuine move-on candidate". As for owing her place in the contest to David Miliband, who lent her some of his supporters in parliament to get enough nominations, you wouldn't know it. It is not clear yet how her presence in the contest has changed it: the four men have certainly said radical things about the role of women in the party, and have all had to promote policy ideas that appeal to what you might call "traditional" Labour voters. But it is far from certain that would not have happened anyway. Those who hoped she would make the hustings a lot more exciting to watch might have been disappointed by how seriously she has taken them - her answers these days seem far more calibrated and thought through that they were when she was just a backbench MP throwing barbs at the government. "I am the best person to lead the party because we need to rebuild and revive the party," she says. "We've lost so many members in the New Labour years and I am the person with the most knowledge of the party. I've been a city councillor, I've been a trade union official, I've sat on the NEC. "We need a good communicator, and I thing I'm a proven communicator. And we need to move on from the Blair/Brown years as exemplified in the Mandelson diaries. I'm the genuine move-on candidate - the others are continuity candidates." She says it doesn't matter that she has not had ministerial experience. "Nick Clegg is deputy prime minister; he's never been in government. Tony Blair took over leadership of the party and became prime minister; he'd never been in government. "It didn't matter for Nick Clegg and Tony Blair, it doesn't matter for me." Abbott's public profile rose when she became a regular on the sofa of the BBC's This Week. "Reaching out to a broader audience and making politics and political issues accessible is quite an important thing to do in a mass democracy," she says. She rejects the idea that her bid for the leadership should be seen as less serious than her four rivals. "If you look at the YouGov poll, which is the only publicly available poll, I come second amongst the public, and I come third amongst Labour party supporters," she says. "So why they should take my candidacy less seriously than people who are below me in the poll is a matter for them." During the Labour years, Abbot says: "I was right on more issues than my competitors, which I think is a good prospectus for a future leader. "I was right on tuition fees and all my competitors have come round to my view, I was right on the Iraq war. "I suppose the only think I regret is that I didn't warn more people in Hackney and Islington and so on where I was canvassing that if you vote Lib Dem you get a Tory government because that certainly did prove to be the case." "My own local party lost a thousand members in the New Labour years," she says. "We've got to rebuild the party. But you've also got to take the fight to the Tories and you've also got to show that we're ready to take office again. "The big thing we actually have to do is deal with the terrible disillusion. A lot of Labour voters voted Labour despite some of what had happened in New Labour years. In the end their loyalty to the party came first. That's why we didn't do as badly as some of the polls indicated. "But you've got to deal with the disillusion and then do the practical things, rebuilding the party and turning it into a campaigning organisation." 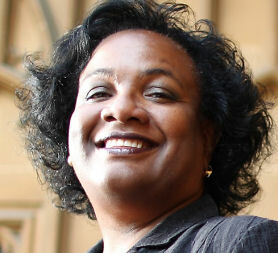 She sees the role of the Labour party as "the voice of ordinary people". "When David Cameron talks about the Big Society the truth is that the poor, the voiceless - they will all be marginalised in this big society," she says. "What he's really saying is that government's going to stop doing a lot of things it used to do, and you're going to have to rely on charity. "So we're going to be the voice of ordinary people versus a cabinet of millionaires." Housing is a key example she uses to demonstrate the struggles of "ordinary people" - people on average incomes. "Nobody on an average income in London can afford to buy a family house in Zones one and two. I can only afford to buy a house in Hackney because I'm a member of parliament, on the top five per cent in terms of salary. And that is ridiculous. "We need to address the issue of bearing down on the housing bubble but also we need a big public sector housing drive. It cannot be right that an ordinary person cannot buy a home in London. That's the sort of issue I'm talking about." Railways are another issue she highlights: "If you asked people, 70 per cent of the public would like to see the railways back into public ownership, and you could do that relatively cheaply as all of these franchises fall due you just take them back into public ownership. "Apparently we're spending millions propping up these private rail companies. I think the railways are something which is better run for the public good and that's a mainstream view that's held by the public." So is she pulling back from the New Labour ethos to embrace markets? "It was never the case the Labour party rejected markets," she says. "Harold Wilson, James Callaghan, they couldn't reject markets." But she says New Labour went too far in thinking the market was "the answer to everything". "There's no question in my mind that we wouldn't have had the rise in hospital infections and MRSA that we had if it hadn't been for the privatisation of hospital cleaning. There's no question in my mind that the privatisation and the marketisation we saw in the health service generally has actually laid the foundations for the things the Tories are doing now which is widely agreed are wrong. "In housing, for instance, our record in government in doing up existing estates is fantastic, but we had a very poor record in building new social housing because we believed the markets should provide - we were wrong. In London the market cannot provide housing for ordinary people." While she insists that "nobody campaigns for higher taxes" she does criticise the Conservative government's plan to cut the public deficit with 80 per cent spending cuts and 20 per cent tax rises as "an unreasonable split". "I think one of the problems with New Labour and its spin and the mentality it encouraged was this idea that taxation has some moral content - high taxation is bad, low taxation is good. Taxation is a mechanism. "Public sector cuts hit ordinary people twice. You lose your services and you lose your jobs, particularly in the North and Scotland, and London and the South East where the public sector is a huge employer. "On top of that there are 1.2 million jobs in the private sector tied to public sector spending. So in terms of growth I think it's a big mistake to cut public spending as hard as that. And yes, I would raise more money from taxation." "We shouldn't throw away the relationships that we have and the respect in which we're held all around the world, and we have a fantastic record when it comes to peacekeeping, when it comes to nation building - we had an intervention in Sierra Leon which was really very successful. And all of those skills, and all of that good will - we shouldn't throw that away. "But broadly speaking our armed forces need to be more in line with our economic capacity to sustain them. It's no good sustaining a level of military might which doesn't reflect the underlying health of our economy. "After all, if you've got to cut schools and hospitals and all the rest of it, it's ridiculous to keep pouring money on armaments." How do you think the Labour leadership contest can be enlivened and made more interesting?